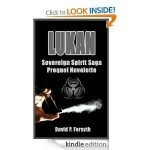 I was given the chance to read a pre release copy of David Forsyth’s latest addition to the Sovereign Saga, Lukan, which is a short story about how the zombie apocalypse started in his series. The premise of the story is a great one, a man who has nothing left to lose and a tumor pressing on his brain, has found people that see the world through jaded eyes, just as he does, nothing but an over populated mess, only they have a plan to manage it, and through Lucan, a means to pull it off. Forsyth draws us into this world of mental decay, explaining any gaps that could not be revealed in his series until now. Lukan is a page turner as you hope for a moment of clarity in the character’s mind, only to end, just as we knew it would, with the birth of the onslaught of zombies. All fans of his series should be picking up a copy of this, now.